SUMMARY: High school student Hannah Baker commits suicide, then sends a set of thirteen tapes to the thirteen people she feels are responsible for her death. WHAT I LIKED: This is one of the more difficult reviews I have written. On one hand, I think Thirteen Reasons Why is an incredibly important read for both teens and adults. Hannah's suicide is the result of her own actions, but every person on her tapes contributed in some way. Some of the actions, such as a girl using Hannah for a ride to a party or a boy kissing her and spreading rumors that it went further, are kind of typical of high-school students. I am in no way excusing these behaviors; I'm just saying that those things happen to thousands of high school students (who don't kill themselves over it) every single day. Reading this book, however, may give readers enough pause to think about the little actions they take and how those actions may play into a larger picture. Asher writes in the end notes about a teen who told him this book makes her want to be a better person, and I would definitely agree with her assessment. Only the most callous person would be able to read Thirteen Reasons Why and not reflect on some way they could better relate to others. I also think the book makes teens contemplating suicide consider the fallout of their own actions. Hannah acknowledges that she did not reach out for help until it was too late for her. Hannah does not recognize her descent into depression the same way the reader does. Listening to the tapes, Clay recognizes it as well. 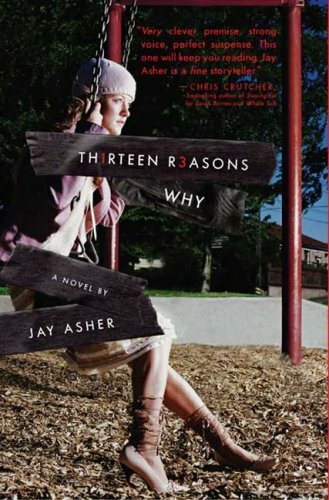 Maybe Thirteen Reasons Why will cause a lonely, depressed teen somewhere to see him or herself in Hannah's character. Maybe that teen will seek help because of this book. WHAT I DIDN'T LIKE: My name is Hannah Baker. I killed myself. It's your fault. I had a very difficult time reading this book. There were times I wanted to put it down and start something else (Elkeles's Chain Reaction came out this week and has been sitting on my nightstand, taunting me, for days). I knew if I did not finish Thirteen Reasons Why now, I would never pick it up again. Unlike many of my students, I do not think it is a page-turner. I found it difficult to care about Hannah, who unfairly blames her suicide mostly on people who are young and stupid. Who isn't stupid as a teenager? Everyone makes mistakes, especially kids. Hannah's victim-mentality and self-obsession drove me crazy. To go as far as to send a tape blaming your death on someone simply because he stood you up for a date or spread some rumors about you or made a list about how you have a nice body is pretty self-obsessed. Yes, being stood up hurts. Yes, rumors in high school can be vicious. Yes, it puts a chink in your ability to trust others. But to blame your death--by your own hand--on that person is just horrible to me. None of Hannah's thirteen has any chance to redeem themselves, to tell their side of the story. And now not only do they have to live with their own guilt, they have to live with the others on the tapes knowing their role as well. That just seems so wrong to me, especially since Hannah is the most guilty one of all. She is the one who didn't seek help, who didn't open up to the people who tried to reach her, who dropped only vague hints about her plans, who swallowed a bunch of pills so she would never wake up. But it is everyone else's fault, and they have to live with that for the rest of their lives. And where are Hannah's parents? Don't they deserve a tape of their own? Aren't they the ones who ignored her and were too busy to see her pain? It seems that if anyone loves Hannah, they would. She barely ever mentions them except to say that they are too busy. She blames a girl (one who barely knew Hannah) for using her for a ride to a party, but her parents get off with barely a mention? So unfair. Besides Hannah's playing the victim, a couple of other minor details bothered me. What is the purpose of the map? I find it odd that 1) Hannah includes it, and 2) Clay follows it all over the city as he listens to the tapes. The map doesn't seem necessary since the town does not seem all that large, and all of the places mentioned are places the characters are familiar with. I was also annoyed with the dual-narrative. When Clay's thoughts or actions interrupt Hannah's story, it takes some of the momentum out of what happened to Hannah. I don't really need a sentence to interrupt Hannah's story just to tell me that the man wiped off the counter or that Clay took a drink of his milkshake and enjoyed it. At times, I had to re-read a paragraph or two because I did not mentally switch characters in my mind when the font changed into and out of italics. Overall, I am not a fan of Thirteen Reasons Why. I think it is over-hyped and melodramatic. To me, there is only one reason that matters: Hannah never really reaches out to anyone or accepts the people who try to reach out to her. Hannah did it, and no one knew enough to stop her. Hannah is mentally ill and needs psychiatric help; if her parents could not recognize that, how could she expect her classmates to see it? STATUS IN MY LIBRARY: We have two copies; it's very popular. My students keep telling me I HAVE to read it. Well, now I have. I was so disappointed with this book as well! Hannah was a terrible, self-centered character who I couldn't bring myself to care about. "Over-hyped and melodramatic" sums it up perfectly. Hannah just isn't a healthy person. While (thankfully) there are many people out there who are always trying to help others, not everyone is like that. It is unfair that she blames some of those people for her suicide. The things they did are wrong and insensitive, but my goodness, they are just kids. They are immature by definition.